The ADAC Zurich 24h-Rennen Nürburgring is known as the world’s biggest and most demanding motor race. 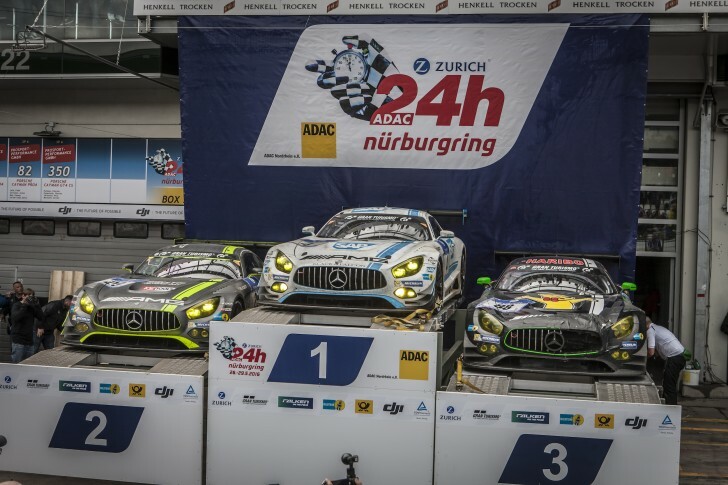 Last year, the Mercedes-AMG GT3 finished in first, second, third, fourth and sixth place in the legendary marathon race at the Nordschleife. A historic result that certainly will remain unparalleled in this manner. Nevertheless, Mercedes-AMG Motorsport is facing the huge challenge and has a strong team and driver line-up for this year’s season highlight (25-28 May, 2017). Last year’s winners, Mercedes-AMG Team BLACK FALCON and Mercedes-AMG Team HTP Motorsport will be present with two cars each, while the HARIBO Racing Team Mercedes-AMG will be running one car. Thus, five Mercedes-AMG GT3 will be competing in the classic endurance race at the legendary Nordschleife of the Nürburgring with extended factory support. With Maro Engel and Edoardo Mortara, the high-class driver line-up for the 24-hour race includes two drivers from the ranks of the current Mercedes-AMG Motorsport DTM Team. Other seeded drivers for the classic race are Uwe Alzen, Lance David Arnold, Nico Bastian, Dominik Baumann, Maximilian Buhk, Yelmer Buurman, Adam Christodoulou, Maximilian Götz, Christian Hohenadel, Thomas Jäger, Manuel Metzger, Stefan Mücke, Dirk Müller, Edward Sandström, Jan Seyffarth and Renger van der Zande. The starting numbers of the cars have yet to be determined. Next to the five Mercedes-AMG GT3 of the Performance Teams, BLACK FALCON, HTP Motorsport and Customer Racing Team Landgraf each plan to run one additional Mercedes-AMG GT3 as Customer Racing entries.